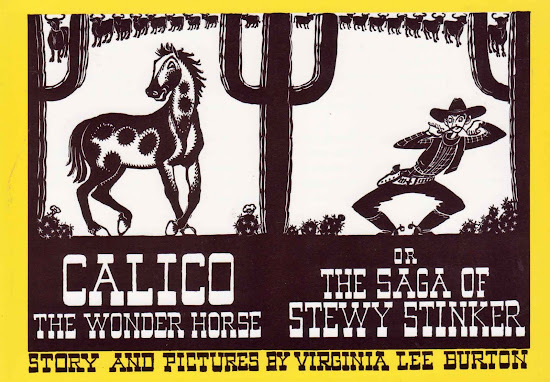 As promised, I am sharing the love from last week's mega library sale and giving away a basically brand new reprint of the Virginia Lee Burton classic, Calico the Wonder Horse or the Saga of Stewy Stinker. All you have to do to be entered to win is comment on this post between now and Sunday, April 17 at 11:59 PM. A winner will be selected at random and announced the following morning. Exactly like I did this morning when I reached into the imaginary hat and pulled out the name Bitter Root Mama as the winner of the Dr. Seuss classic give from last week. Congrats and e-mail me at webe(at)soon(dot)com. More later! Oh, ME, ME, ME!! That's one I haven't found at the library sales yet! I did finally get a copy of her "Song of Robin Hood", though. Looks like a cute book (and one that I don't have in my library) please enter me. I would love to have this one! Yep, gotta try for this one. It looks really good! I have been dying for a copy of this ever since you first posted about it way back when! This book reminds me of the great Roy Rogers song, "Rusty was a rockin' horse." Looks like it would be a great osundtrack to this books. I'm a habitual lurker here...thank you for creating this beautiful blog! I've never heard of that book. It looks really fun, though. The only cowboy book we have (2 girls) is Cowboy Small by Lois Lenski. I'd love to read this. Thanks for the opportunity! BTW - I love your blog. I use it as a resource before I go to the library with my girls. Thanks! I had not yet discovered your blog when you posted on this book originally, so I'm delighted to be introduced to it now. And of course we'd be excited to win a copy. I am dreaming about a calico horse I may have to make one . . .
Oh! Oh! I would love this one! My little one loves horse books and we just can't seem to find much at our local library. We'd love to have this one! Looks like a cool book. Virginia Lee Burton is awesome! I love Virginia Lee Burton and don't have this one in my children's library! Thanks so much for the chance to win another great one! This is one of our VLB favorites, but I don't have it!!! It's frequently requested from the library so my boys can enjoy it! Wow! I've never seen this one before. Please enter me! Oh, yes please. I love Virginia Lee Burton! I've never seen this book before and I'm a fan of Burton! One of my early memories of books includes her At the Little Brown House. She is timeless! Here's hoping! I just read your Wizard of Wartsvile comments and having read that scrolled to the bottom and saw this link ! Oh it would be so super for my 8 year old grandson. Too fun that there is a chance to win this book!